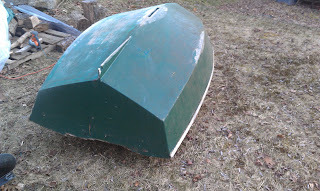 I finally finished up the dinghy project for the most part. I still need to varnish and do some more trim work, but we got it out on a local pond for an inaugural sail. I'll post more photos and details later, but here's a few shots of the first sail. I've been puttering around this thing all month doing a little work here and there getting it ready to go. I added a few more sections of glass at the bow and stern to strengthen them up but the big push was to get the sailing rig done. 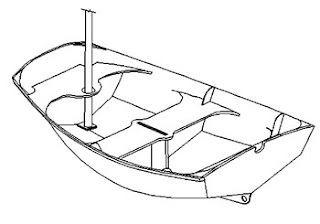 I'm not there yet, but I ordered an optimist sprit sail from www.IntensitySails.com. 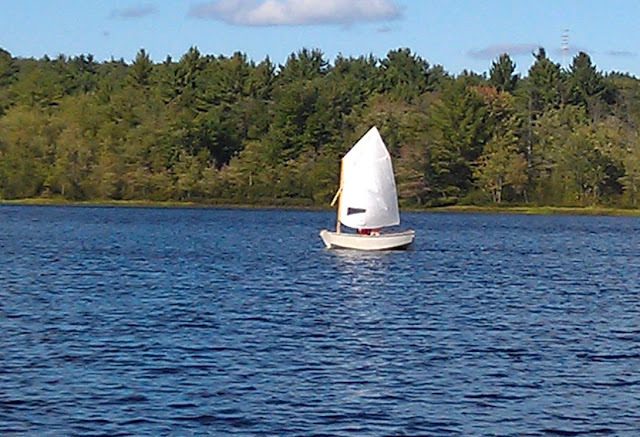 It's the third sail I've bought from them over the years (the other 2 were for my O'Day Daysailer). 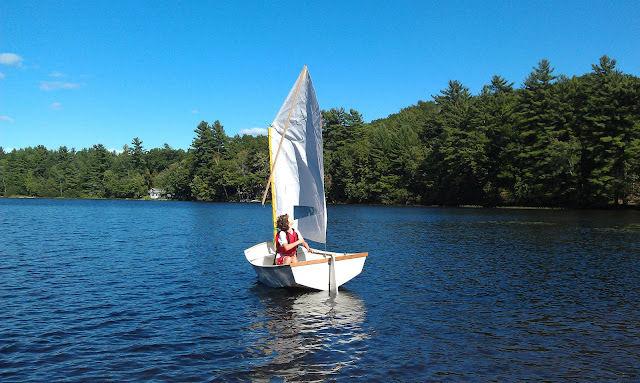 I'm not a racer, so I can't comment on how well their sails will race, but they do ship a great product that holds up and is cheaper than making it yourself (with a Sailrite kit). I ordered it Tuesday night and it was at my door Thursday morning. Nice! 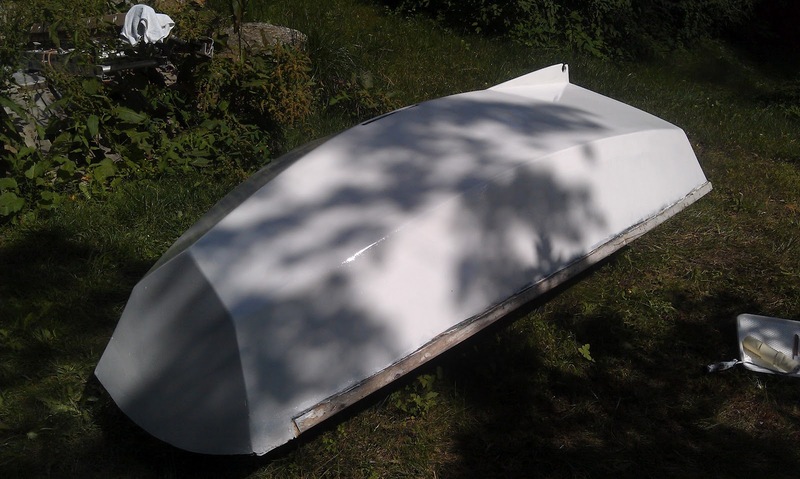 With the sail in hand, it was time to start building the rig for it. I wanted to keep this project on the cheap, so I went to Home Depot and bought a nice 8' x 8" piece of white pine with no knots in it. 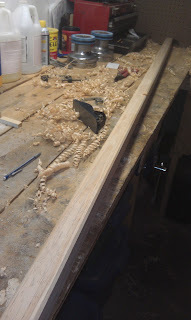 I ripped 2 - 2 1/16" pieces and 2 - 9/16 pieces and ran them through the planer to get a nice crisp edge, then I cut a few filler blocks and laid everything out. 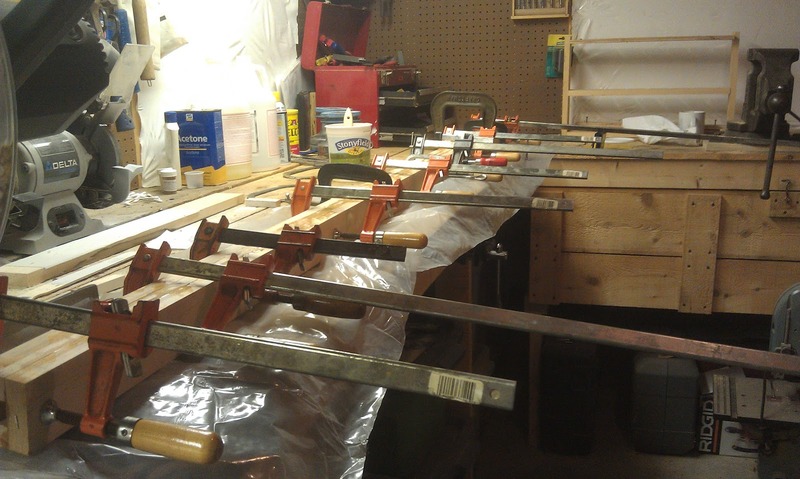 I wanted to build a hollow spar, so I set it up as a box and coated everything with epoxy and clamped it all together. The next morning I came back and cut off all the squeeze out before running it through the planer again. The result is beautiful (if I do say so myself). 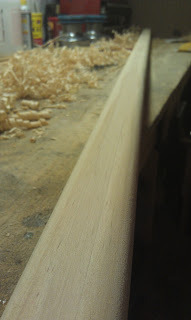 The joints are perfect except at either end where there was a little snipe from the planer, but I plan on cutting those off anyway, so no matter. With the help of my son, we block planed the edges down to a nice roundover and sanded everything down. The end product is a squarish round spar that just looks great. I'll put a bunch of coats of varnish on and call it done. 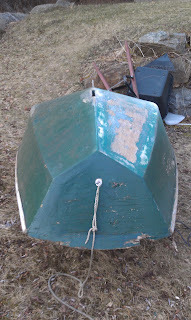 Next I'll be setting up the sprit and building the mast step and hopefully get the whole rig completed by weeks end. 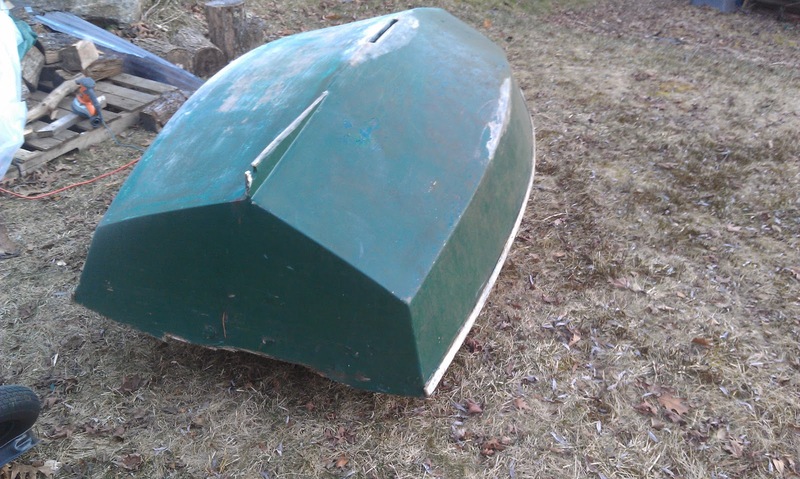 After that I have to build the daggerboard and rudder and we'll be good to go. The pintles and gudgeons I ordered have yet to ship so now it's a waiting game. So it looks like I need a lot of practice when it comes to painting. It's always my least favorite thing to do and I tend to get impatient with the process. Since I've never applied a 2 part paint before, I decided I should use the dinghy as the test dummy and hopefully refine my technique. I think most people buy the amount they need and mix it all together (3:1 volumetric ratio) in one can, but I wanted to do the dinghy first and then Magic in several steps, so I needed to mix things up outside of the main can. 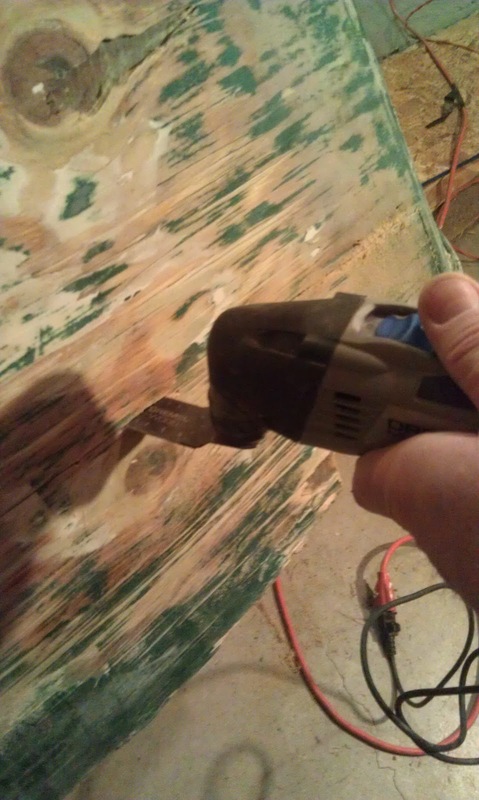 The problem with mixing the ratios with this stuff is that the catalyst (the 1 part of the ratio) is liquid, while the paint part (the 3 part of the ratio) is more like a putty. 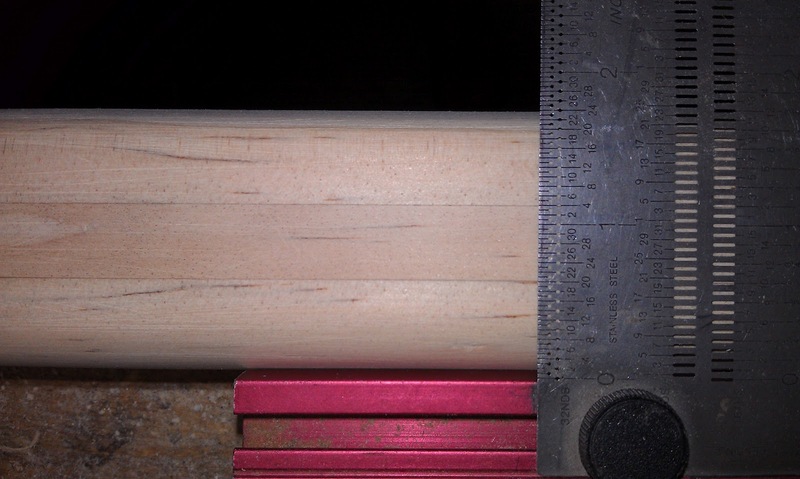 So measuring by volume is a bit of a challenge. I ended up adding 5 oz catalyst to the container and then plopping the paint part in until it all added up to 20 oz (15 oz of paint). Then I waited for the 20 minute induction time and then added 5 oz of 2333N brushing reducer and mixed well. I rolled it on in roughly 2x2 sections and then tipped it out with a china bristle brush. 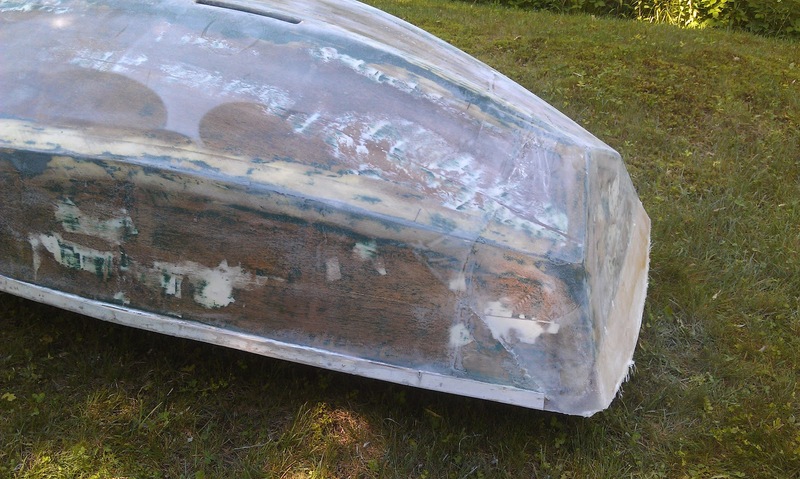 Because I'm doing this outside on my lawn and not in the boat shed, a bunch of bugs decided it would be fun to fly into the paint. Oh well, I'm not too concerned about the dinghy look anyway, I just wanted to use it for practice. Over the winter I managed to get most of the dinghy glassed, but had a few sections to finish up. 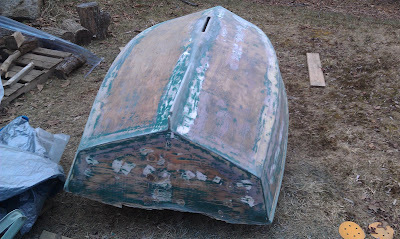 This weekend I moved it outside and got the rest of it glassed, with 2 layers on the bow, stern, and the keel section that should provide some additional protection. Next I'll do a rough fair coat and grind it fair. I built a PK78 about 10 years ago and I've grossly neglected it over the 4 years that Magic has been out of the water. My 11 year old son took an Optimist sailing camp last summer and this boat is pretty close to the "Opti" spec (but a bit more rocker) and takes the same rig and sail. Our winter project is to restore and recondition the hull and build a rig, daggerboard, and rudder/tiller for her. The boat was underneath a tarp for almost 4 years and was resting upside-down on the bow and stern. As a result there is rot to varying degrees in both ends and they will need to be addressed. 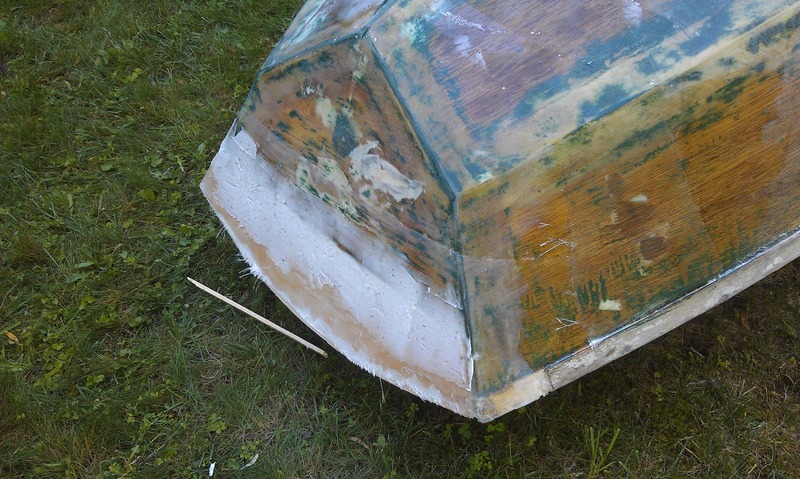 When I originally built the dinghy, I used 1/4" luan doorskins for the hull material and a simple stitch and glue technique. I taped and epoxied the seams and coated the outside of the hull with epoxy. As part of this restoration, we'll also put a full layer of 6oz cloth over the entire hull to strengthen it up. Over the past week, I sanded the hull down to bare wood and moved it inside my shop so we could be comfortable and have the heat needed to allow epoxy to cure. 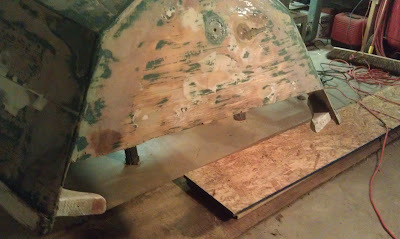 I decided to start with the bow so I sounded it out to find the limit of the rot and cut it out with my oscillating cutter (perfect for this sort of thing). 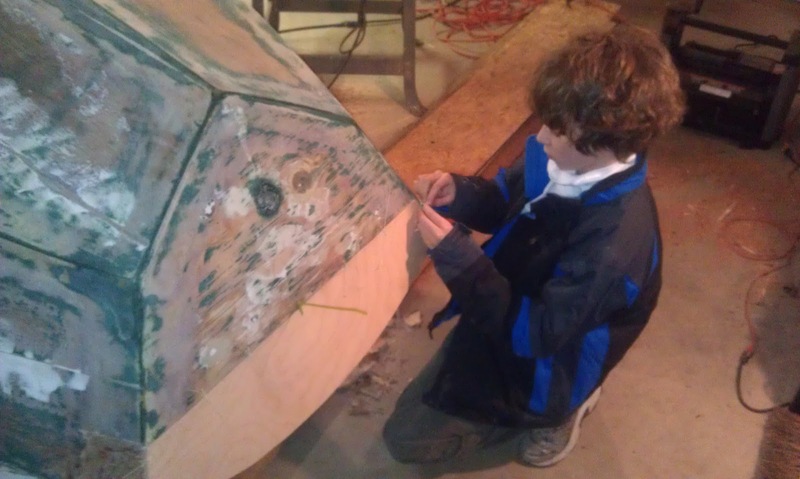 Next, my son and I traced and cut out a new section of 3/8 birch plywood to replace it and drilled 'stitch' holes on the boat and the replacement wood. 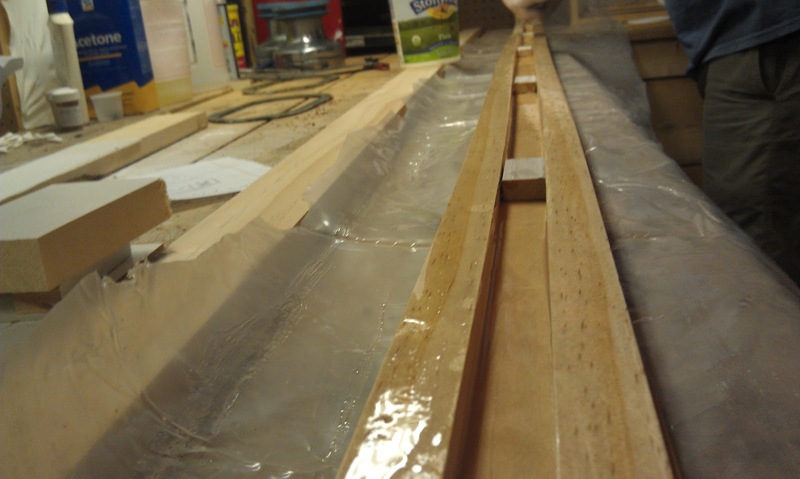 We stitched the new section back in with twine and a zip tie to hold it in place for epoxying. 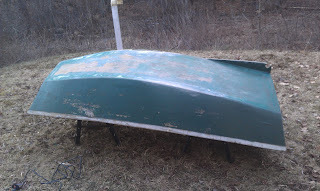 Once we were satisfied with the new section, I cut out the 5.6oz cloth for the area and laid it over the entire bow. 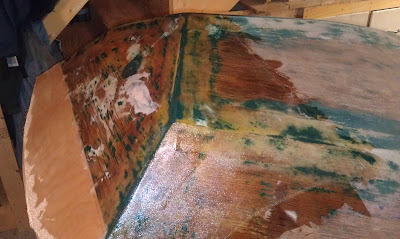 Then I mixed up 6 oz of epoxy and spread it out over the cloth with a brush and 4 inch plastic spreader. 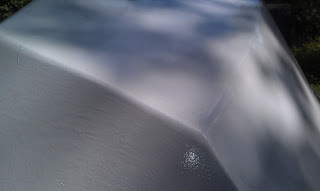 I love the way the light cloth lays and forms to all the contours. 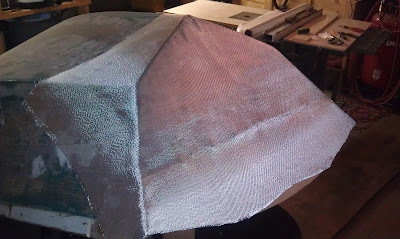 Compared to the 1708 biaxial fabric I've been working with it feels like fine silk. Below is a summary of work in pictures over the past week or so. Jake busy stitching the new section in place. Glass cut and ready for epoxy. Epoxy applied. I'll probably do 2 layers here.